September 16, 2013 By Allyson 2 Comments This post may contain affiliate links. Read my disclosure policy. 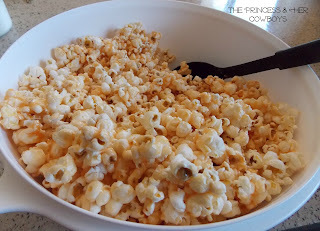 Today we have a great guest post from Britney! She is sharing a recipe for Mother Goose Popcorn, and I love how playful it looks! Hi all! I’m Britney from The Princess & Her Cowboys and I’m excited to share this fun family treat with you today! 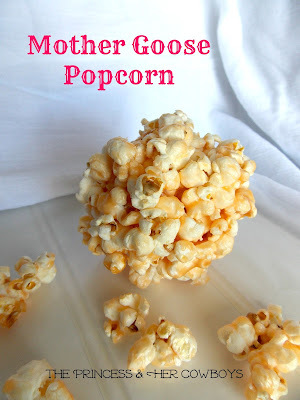 I wish I had some great story as to why we call this Mother Goose popcorn but I don’t. That’s just what we’ve always called it! 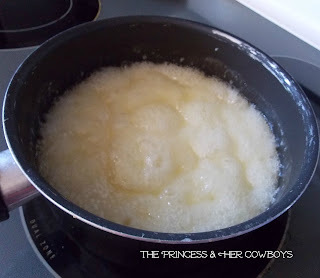 To start, combine 2 cubes of butter, 3/4 c sugar and 1/2 c Karo syrup (the clear kind). You’re going to cook it until it reaches a soft ball, or 240 degrees on your candy thermometer. I need to get myself a candy thermometer so I had to look up ways to tell if it had made it to a soft ball. Get yourself some really cold water and spoon a little bit in. If you can mold it, then it’s done. 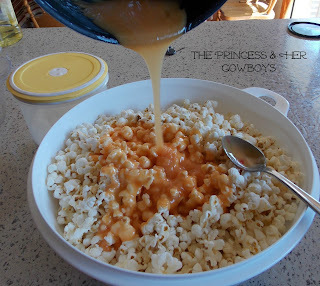 Pour over a large batch of popped popcorn, stir it up and there you go. My favorite part of this is that we always got to choose the color of it, adding just a few drops of food coloring. Because it’s fall/almost Halloween, I went with the orange. Bring first three ingredients to a soft ball, or 240 degrees Fahrenheit. Pour over a large batch of air-popped popcorn and mix well. 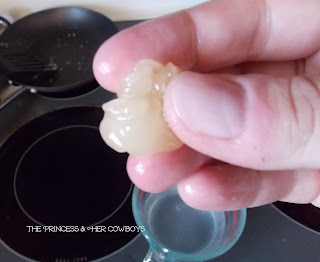 Britney blogs at The Princess & Her Cowboys all about crafts, DIY projects, thoughts and recipes. She loves to be with her family and doing anything active, preferably outdoors. She loves to get to know people from all over so stop on by and say hello!